Lately, Snack Girl has been deluged by requests about toaster pastries and frozen waffles. So, I decided to take a walk down the cereal aisle. On the top shelf were two brands of toaster pastries: Fiber One and the famous Pop-Tarts. Both brands were advertising a 20% daily value of fiber. Could Kelloggs have transformed Pop-Tarts into a healthy choice? Regular Pop-Tarts have less than 1 gram of dietary fiber. New and improved Pop-Tarts have 5 grams of dietary fiber, which has been added by using whole wheat flour as the first ingredient. Remember that they are not considered 100% whole grain unless all of the flour used to make them is whole grain flour. The problem here is that the rest of the ingredients in this chocolate fudge Pop-Tart remain the same. High fructose corn syrup, sugar, dextrose, corn syrup, are just a few of the examples of the sugar added to these pastries. It is admirable for Kelloggs to want to improve Pop-Tarts. My opinion is that this is lipstick on a pig. I do like Pop-Tarts, but they should be considered a cookie and NOT breakfast. I can't imagine eating 380 calories (2 Pop-Tarts) and feeling like I had a great start to my day. I would have consumed 28 grams of sugar - 6 teaspoons! - and I am sure I would crash around 10 AM. I know this is not news, but breakfast is your most important meal of the day. It sets you up to feel good or feel like crap. If you can only make one meal a healthy one - this is the one to choose. My suggestion is to look for other cereals or frozen pastries that have both fiber and less sugar. Basically, what works for cereal (see: Candy or Breakfast? Evaluate Your Cereal will work for other "cereal like" products. Use your common sense as well. Do you really think something called "Frosted Chocolate Fudge" is going to be a healthy breakfast? I know that there isn't a parent out there who doesn't want to give kids what they want. This packaging helps parents to absolve their guilt when their children demand Pop-Tarts. So, give them these improved Pop-Tarts, but as a TREAT not as breakfast. What do you think of PopTarts? Please share. Okay, how about blueberry! Plenty of antioxidants, right? Good for you! Okay. Fine. Pop Tarts are evil. I personally don't care for Pop-Tarts, but I think anything is okay in small quantities. If someone with no underlying problems (like diabetes) wants to eat a Pop-Tart once or twice a month for breakfast, it's not going to be a serious issue as long as the rest of the time they are pursuing healthy option. My feeling is that these sorts of things should be placed in context as part of ones overall diet. The main issue in America today is that these sorts of things have gone from special treats on a the occasional Saturday morning for kids to something people eat everyday. Pop-Tarts are definitely a dessert, not a breakfast item. I don't even know how people eat that stuff; it's so sugary sweet! There is a woman at my gym who teaches a fitness class and is otherwise there every morning working out. Her children go to the gym daycare along with my child. Almost every morning they show up with Poptarts for breakfast. I keep thinking, why does this otherwise health-conscious person keep feeding her kids crap for breakfast?? They often then get a "treat" of candy afterwards! Proud to say I have never bought a pop tart, ate one once about 25 years ago...and never again. I love sweets but who is eating these things? These are gross and too sweet, you are better off with a slice of bread and a piece of fruit. A Pop Tart has over 50 ingredients in it. It's a chemical not a food. They can sprinkle as much fiber on it as they want, however, it will not disguise the fact that it is a chemical. "Lipstick on a pig", hehe. I agree - injecting processed food with things like fibre or calcium or what-have-you just glorifies the junk food. It doesn't make it healthy. I saw a commercial last night for some sort of breakfast pastry with the claim that it would help you to get your child to eat breakfast. I couldn't help but think - who doesn't like breakfast?? There are SO many healthy, quick, fun options. Between cereal, oatmeal, yogurt, eggs, fruit, smoothies, waffles - is it really that big of a problem to get them to eat something good for them versus a dessert? It's offensive that they think they're fooling anyone. Thanks for spreading the word. I think the one thing that I'm so grateful about me, is that I'm not tempted by sweets. I mean, i still want to eat sweets every once in a while, and cakes and donuts are yummy, but i rarely get that craving for these kinds of things, whereas I know people who can't resist chocolate, and puts a ton of sugar in their coffee because they love the sugary taste. My vice, unfortunately, is salt and meat LOL. in any case, i agree that breakfast is really important. I used to dismiss that and end up skipping breakfast and go straight to lunch...talk about bad idea. nowadays i have either two things: 1 or 2 hard boiled eggs in the morning will last me til lunch time for sure. or my other new fav morning chow is Quick Oats (100% Whole Graint Oat Cereal) from Safeway, a half handful of organic raisins, and just enough Vanilla Soy milk to make the oats slightly soaked through. I don't bother to microwave it (hate the gooeyness of hot oatmeal actually), i just eat it cold like that. and it taste AMAZING. I got the idea from your nobake oatmeal cookie recipe, and it lasts me definitely until lunch! Lmao @That Neil Guy... Pop-Tarts ARE evil, but oh so yummy. I actually like the Fiber One pastries. They make a good snack when I'm in the mood for junk food. I'm just glad I am conscious of the fact that they're junk food and not real food. I've never liked them-they've never tasted anything like food to me! Don't get me wrong, I like sweets, but not Pop-tarts. I agree that they're chemicals really, not food. I love this blog! I have always been a fan of poptarts, but just recently found the organic ones. The organic ones have all natural ingredients, so you think you are doing better.... Nope, still high on sugar, which is a bummer. My favorite breakfast choice is yogurt (minus High Fructose Corn Syrup, Yoplait has hfcs!) With homemade granola and fresh fruit. I don't feel hungry for like four hours:) Thanks for the great info! 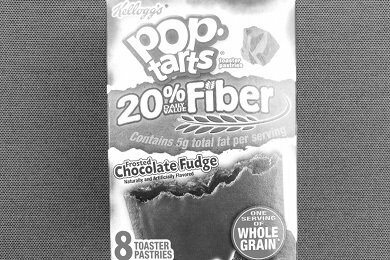 Really....people think that Pop Tarts are healthier with the label 20% daily fiber. People need to understand that labels don't always tell the whole truth. Plus, I would like to know how much protein goes into a Pop Tart. You should start your day with a good protein because that will keep you full of energy for the morning until lunch. Yeah....real healthy breakfast choice for young minds in school (sarcasm in voice). I like the strawberry Fiber 1 version... I know they are bad, but when time is an issue, it helps to be able to take your breakfast on the go, hot or cold vs mixing up a smoothie or whatever else. It's not something I eat often though b/c I can never even find them at my local Kroger. Also, WHERE are these vita muffins?? I hear all this great stuff, but I cant find them anywhere! Does Kroger carry them? ?